Housemates have been hectic the whole day, working on their Extravaganza pieces. Both teams have been working hard and doing their best to come up with award-winning performances. Ellah was a little worried with the break that her team took and when Kacey Moore reasoned that perhaps the hotshots were hungry, she snapped back, stating that they did not have the luxury to attend to their hunger. Whilst resting and taking time out, Idris and JJ ended up talking about Samantha and JJ continued to share how smitten he was with the South African lass and that he had to however pull back. In a conversation with Permithias two days ago, JJ said that he would let go of Samantha and actually focus on a relationship that he left unestablished back home. He even described the lady and exclaimed her beauty, exalting it above Rihanna's. He contradicted himself in the conversation with Idris, sharing how it bothered him that Samantha found a bad side to everything he did. He told him that the more time he spends with Samantha the more he is led to believe that she is "the one" and that he found it hard to contain his feelings for her. Idris advised him to shut off his feelings and told JJ that it took him a punishment to forget about Goitse. JJ told Idris that as Samantha's friend, he hoped that he could communicate the right things to her and be the link that he needs. Idris advised JJ to consider if the feelings were mutual so that he did not waste his time. 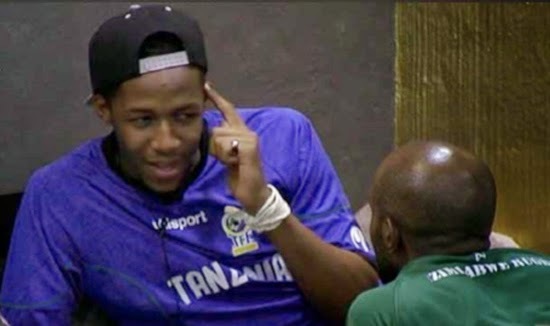 As the housemates continued to relax, lunch slowly brewed in the kitchen and Biggie announced that the two teams would soon get their one hour opportunity to rehearse on stage, in preparation for the Extravaganza. This should distract JJ a bit and he probably made the best decision not to be in her team. What do you think?